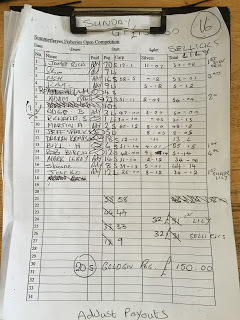 After six matches on Longs, I knew Pete was putting us back on Sellicks for today and the silvers weights haven’t been great with Ray Wickham only needing two crucians for 4lb 11oz to win a few weeks back. When I pulled into the car park, one of the first people I met was Glynn who said the match was going to be spread over Sellicks and Lily and regular readers will know I just can’t seem to do any good on Lily and apart from the first time I fished it, I’ve never won a bean on there since! To be fair, Lily does produce some good silvers weights and there’s loads of small carp in there but like I said, it just seems to be my bogey lake! As I was getting some nets, Roy Hughes made me feel a little more optimistic about Sellicks when he said he’d pleasure fished it in the week and had around 7-8lb of skimmers and crucians from peg 8. Just before the draw Pete got Daren Kempson to pick out the golden peg and he pulled out peg 20 on Sellicks which you would have run to a while back for silvers but I didn’t think it would compete with Lily today. 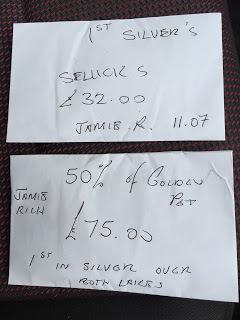 I do like the way Pete runs the golden peg, it’s capped at £150 and when that limit is reached another is started, if you win off it you obviously take the pot but if you win the silvers from a golden peg you get half the money which I think is a great idea as a lot of anglers like to fish for silvers rather than the carp. I went into the draw bucket late and there were just two balls left, I grabbed one and when I looked, it was peg 20, that was safe then! I took my kit to the peg and I had Daren on my right on peg 18 and Adam B was on 22 on my left and he said he’d won the silvers on Wednesday with 7lb 10oz so maybe it wouldn’t be as bad as I first thought. Pete walked round and said he was paying the top four overall plus the top silvers on each lake, he also said to not forget that hand sized carp count as silvers (which I have to say I don’t agree with, to me a carp is a carp, well, unless it’s a crucian!!! !, confusing isn’t it?). I set up a 0.4 gram Malman Pencil with a spread bulk and a size 16 Tubertini 808 to 0.10mm and also a Drennan 0.6 gram G-Tip with the same hook etc but as I never picked it up all day I won’t mention it again. On my side tray I just had some 4mm Bait-Tech Xpands which I pumped with water that had been ‘Juiced’ up and I also used it to soften up my micros. I decided not to bother with a groundbait line this week as I haven’t really caught over it in recent matches. It was a nice bright, sunny day although there was a swirly wind that couldn’t make its mind up which way to blow! Adie signalled the start and I cupped in half a pot of micros on two lines at ten metres, angled left and right and the same amount on the five metre line. I went out over the left hand line and after about ten minutes, I missed a cracking bite (nothing new there then! ), next chuck the float sailed away again but this time I hit it and was soon slipping the net under a little 4oz carp to open my account. I hit the next bite too and this felt like a better fish and it also didn’t feel like a carp and I was delighted when a 1.5lb crucian popped up, what a great start and it didn’t end there when I had a decent skimmer on the next put in, followed by a 4oz skimbob and the last action of the hour was a 4lb carp and as much as I would have liked to say it was hand sized, I think a few eyebrows might have been raised! So with around 2.5lb of silvers after an hour plus that carp, I was doing well, Adam had caught a couple of carp and I’d seen both Daren and Nigel Wickham up on peg 16 land a couple of fish too. 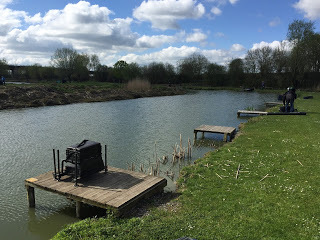 The second hour also went really well and swapping between the two longer lines I had another decent skimmer, a couple of blades, small carp and then another lovely little crucian to put me on around 4-5lb and if I could carry on like this, maybe winning the golden ball might be possible. I should have known better as it all went a bit pear shaped in hour three, I had a few small skimbobs but lost a decent skimmer shipping back and then foul hooked two carp both of which came off and probably only added a pound or so to my silvers net during a frustrating sixty minutes. Adam was now catching carp quite well and when I had one from the left hand line I felt it was time to try my shorter line which I’d been feeding from the start via a toss pot but apart from a couple of knocks, nothing much was happening so I went back out and had another decent skimmer plus a few smaller fish including a 3oz rudd and my catch rate was still ticking along nicely. Mark Leahy was having fun up on peg 14 with the carp and the lilies and at one point there was that sickening crack that no angler likes to hear when a top kit snaps under pressure. I was still getting regular indications and had another decent skimmer around the pound mark, plus some smaller ones, another little carp, a 4oz roach and I was really enjoying myself. A couple more carp disrupted things a bit, especially one hooked in the bum that I had to reverse into the net after a lengthy battle. A fifth decent skimmer put me on around 7lb, maybe a little more and I was hoping it would be enough to win the silvers on our lake. With around half an hour left I had another go on the five metre line but all I could muster was one tiny blade. Glynn Wickham arrived and he’d struggled on Lily with the wind in his face all day, he also said nobody had really bagged up on silvers or carp. I managed one more small fish before Adie blew for the all out, my final tally was twenty eight silvers which included two crucians, five decent skimmers, five hand sized carp plus some blades, roach and rudd and I hoped I had around 7-8lb. I also had five carp but I knew I wouldn’t be troubling the overall frame today. Glynn walked up to see how Nigel had got on and when he came back, he said Rob Birch up on peg 12 thought he had around double figures of silvers – bugger! I was pretty sure I didn’t have that and felt pretty deflated as I thought I’d fished a pretty good match. The scales arrived at Adam to begin the weigh in and he set the pace with 54lb 4oz, then my five carp went 19lb 1oz and when I pulled my silvers net out, Adie called 11lb 7oz which was better than I thought but I didn’t think it would be enough to win the lake. Daren had 13lb 6oz and then Nigel had 53lb 1oz to go into second place. I took my kit back to the car and passed Martin Addicot who’d been on peg 2 and said he’d had a big crucian, a couple of tench, two decent skimmers and some small carp and was admitting to 8lb, so he wouldn’t be far away either. I loaded my kit into the car and just as I shut the boot, Rob arrived and said he’d weighed 9lb 14oz of silvers so I was still leading the lake. I walked up to watch the rest of the weigh in just as the scales had finished on Lily, Steve Jackson had the best silvers weight there with 8lb 12oz from peg 12 and I was still the top silvers weight with only three anglers left to weigh! Bill Hopping had 55lb 15oz from peg 6 to go into the overall lead, Roy Hughes didn’t weigh on peg 4 and that just left Martin, was he going to spoil it for me? When he pulled his net out, I still thought it was going to be close but he proved to be a far better estimator than me as Adie called out 8lb exactly and I’d done it!!!! Back at the results and Bill was announced the winner and it had been a really tight frame with one fish separating the top four weights, Jacko won the lake on Lily for silvers and then I picked up £32 for the lake silvers win and £75 from the golden ball, what a lovely day with the only downside being that I didn’t have a side bet with Glynn. A double envelope this week! Double header next week as it’s a Bank Holiday, it’s Sellicks/Lily on the Sunday and Longs on the Monday.